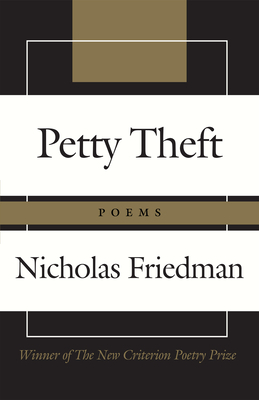 In Petty Theft, Nicholas Friedman cultivates the strangeness of daily life and turns an unsentimental eye to joy, catastrophe, and the myriad stations in between. The poems often set us wandering: to the busked streets of Assisi; to a burning circus tent in Hartford, Connecticut; to a stone circle in England; to the poet's native Upstate New York; and to his adoptive California, where a wealthy neighbor "lives behind a massive hedge, four-square/ like a curtain wall/ that keeps us here, him there." The "theft" of this collection's title lurks on every page, luring faith to doubt, love to loss, and appearance to illusion. Yet these poems never lapse into hopelessness. Even where failure and tragedy precede human understanding, Petty Theft suggests the possibility of sustenance and recompense. Both confident and questioning, this debut collection announces Friedman as an important new voice in American poetry. Petty Theft is the eighteenth winner of the annual New Criterion Poetry Prize. The New Criterion is recognized as one of the foremost contemporary venues for poetry that pays close attention to form. Building upon its commitment to serious poetry, The New Criterion established this annual prize in 2000. NICHOLAS FRIEDMAN was born and raised in Syracuse, New York. He is the recipient of a Wallace Stegner Fellowship from Stanford University and a Ruth Lilly Fellowship from the Poetry Foundation. His poems have appeared in The New York Times, Poetry, Yale Review, and other publications. He lives with his wife and son in the San Francisco Bay Area, where he is a Jones Lecturer in Poetry at Stanford.